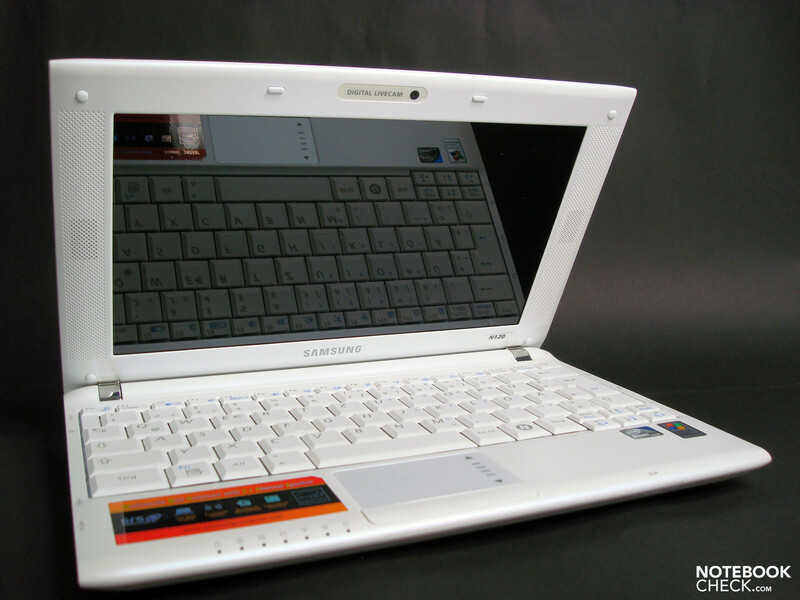 Samsung had gone on the netbook stage late with its NC10, but after a while of market monitoring, hit a homerun right away with the latecomer. The staff is now accordingly high for one of the successors, the N120, which shows a few innovations. How the newbie scores and if it can fulfill the high expectations is shown in the following test. Meanwhile, Samsung has a multifarious product portfolio with the NC10, NC20, N110, N120 and N310 and fulfills the high request in the field of mini-notebooks this way. 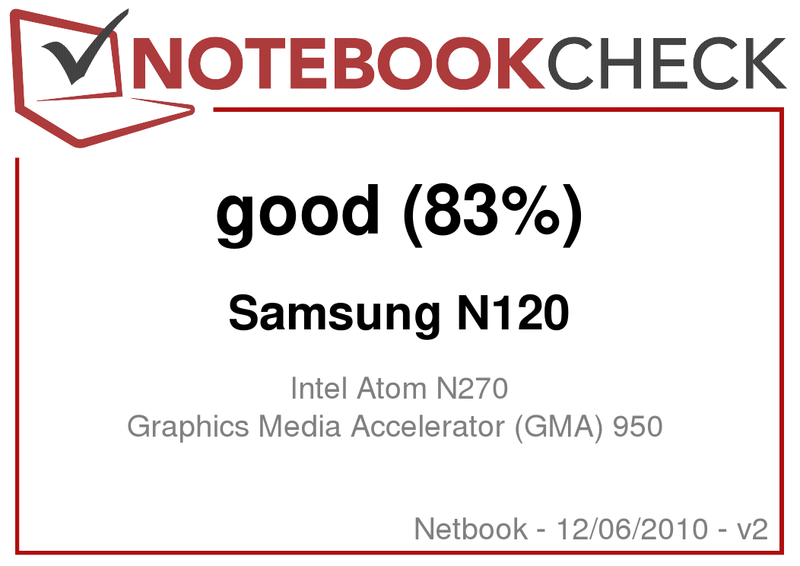 Our Samsung N120 anyNet test model at hand aims more at the mainstream of the netbook market and therefore bids conventional techniques, such as the Intel Atom N270 CPU, Intel GMA950 graphic chip set, 160 GB hard disk and the usual interfaces in the price category of around 400.00 Euros. 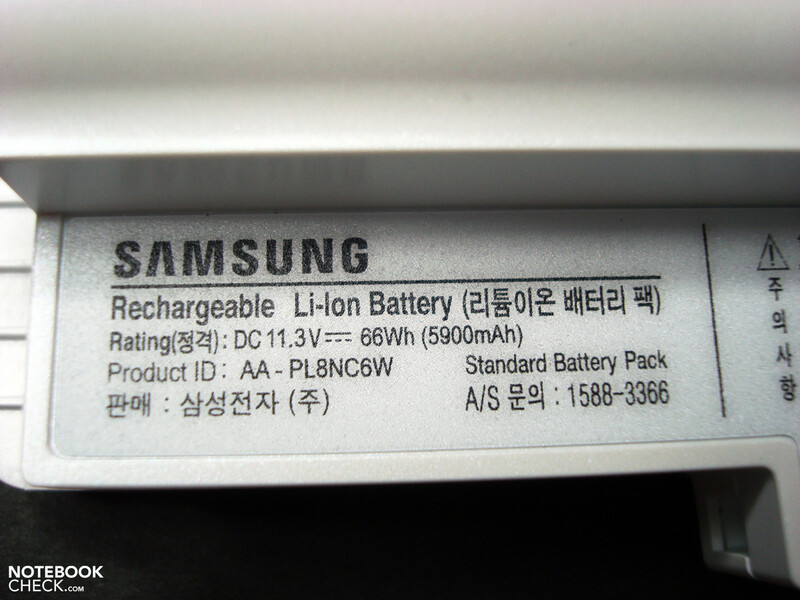 A peculiarity is the large 66Wh battery, which is supposed to provide for long runtimes along with Samsung's energy savings tool Battery Manager. As it couldn't have been expected differently from Samsung, the Duracase casing presents itself in a very high manufacturing quality with a high-quality surface. Insensitive, roughened and with elaborately positioned design elements in a chrome look, you can call the Samsung an optical eye-catcher. You have the choice of Sapphire White (test model) and Diamond Black as colors. 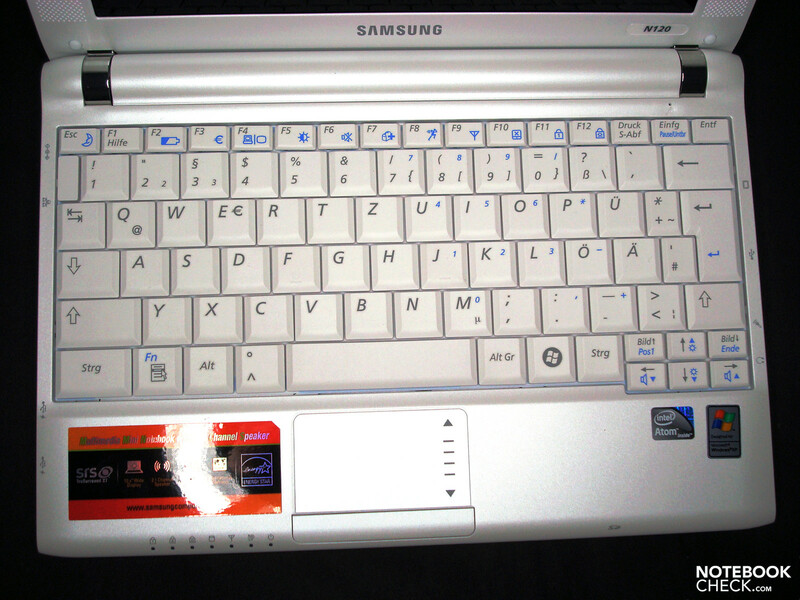 With the antibacterial keyboard, which is based on a silver-ion coating, Samsung tries to also score in the aspect of hygiene and offers something special with that. The base unit has a high stiffness and lets itself barely be pressed in, twisted or deformed in any other way. 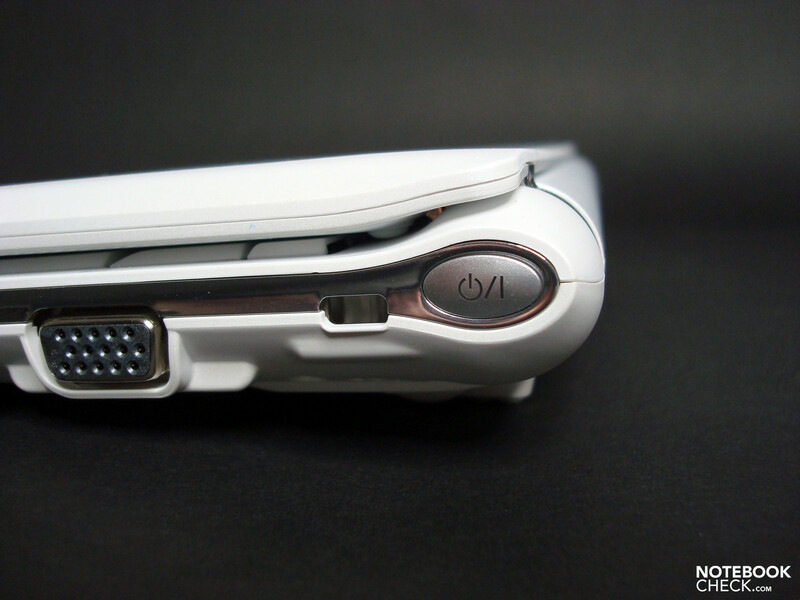 Unfortunately, this sturdiness isn't noticeable in the display lid, a strong deformation is possible. This doesn't have an effect on the image content or the protective functions, but does throw a shadow on the very positive first impression. 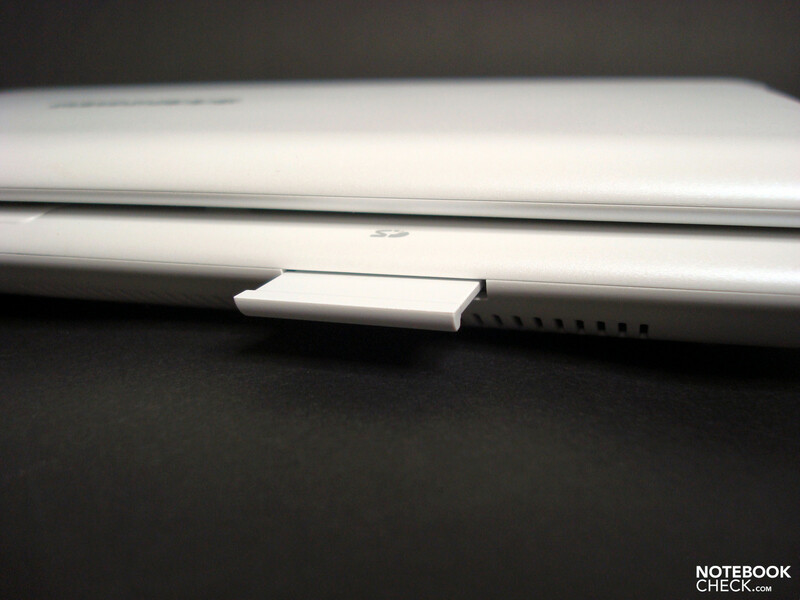 In return, the display hinges do their job, keeping the lid in a closed as well as open position without any objections. There isn't an extra closure for lid and base unit. 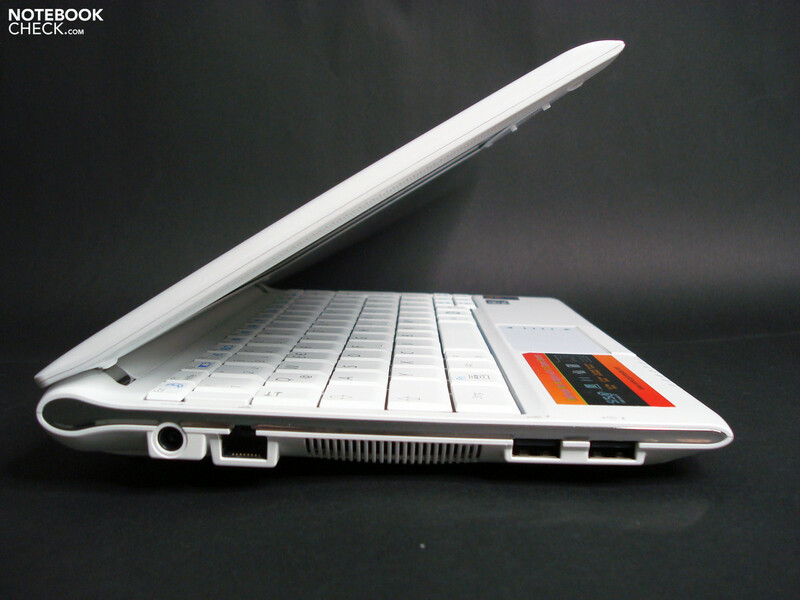 The keyboard is embedded as hard as board, as already in the NC10, and no deflections or clattering can be elicited. 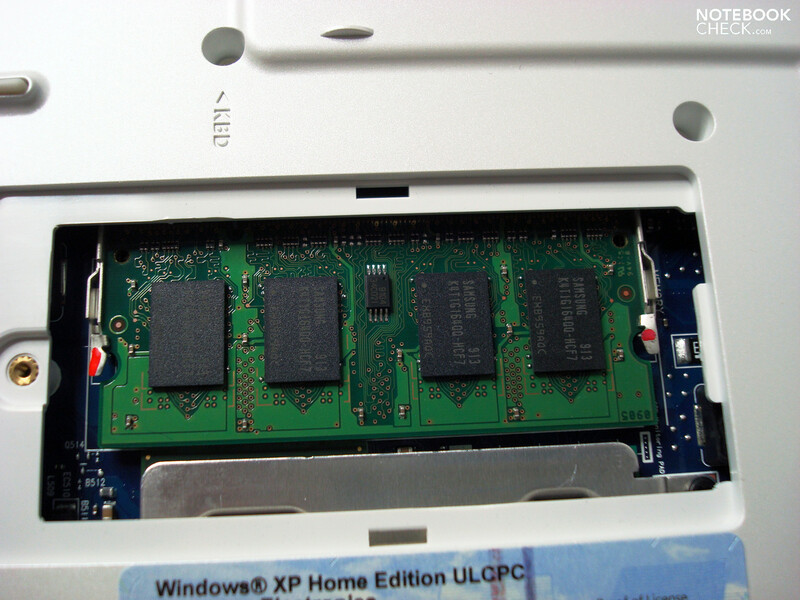 The base has an opening under which the RAM slot is found filled with one gigabyte RAM system memory. 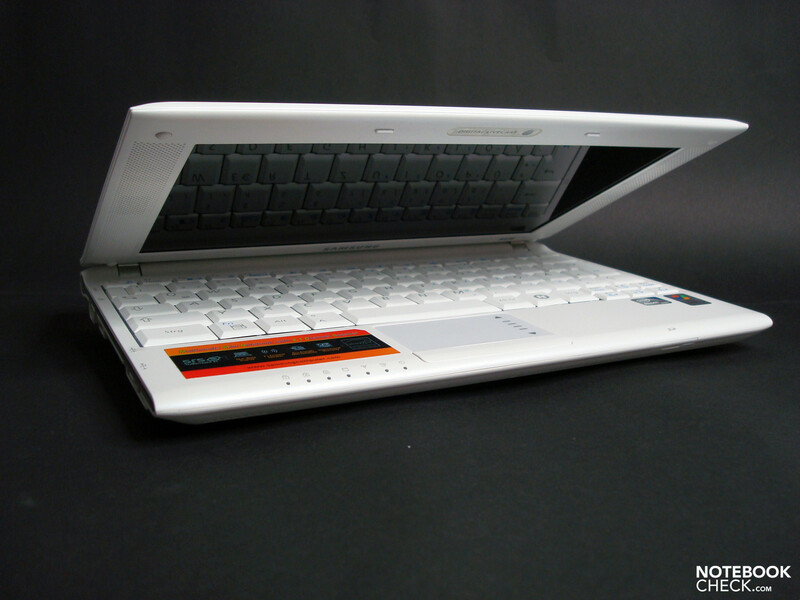 The, as almost for the class common, battery accommodated on the back elevates the case slightly, but appears well-integrated and sits desirably tight. The case has, in comparison to the NC10, gained a bit in its width and depth with 272 (B) x 188.5 (D) x 29.8 (H) mm, but has become about 1 mm slimmer. It was possible to reduce the weight by 200g despite the grown chassis and capacity enriched battery. However you now have to carry an 80g heavy adapter around as a drop of bitterness. There isn't anything special to be found on the N120 in view of connectivity. 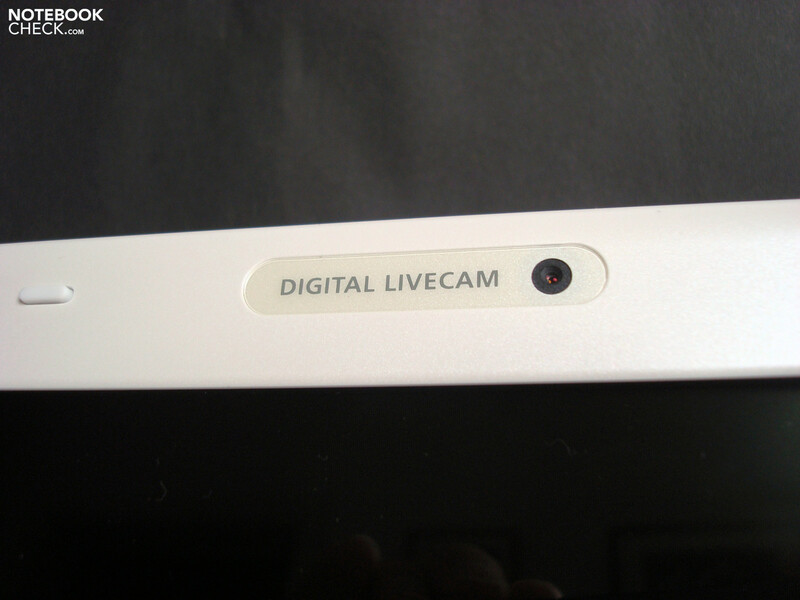 3x USB 2.0, VGA, network, Kensington lock, audio in/out, cardreader and a 1.3 MP SXGA webcam cover the usual basic supply. 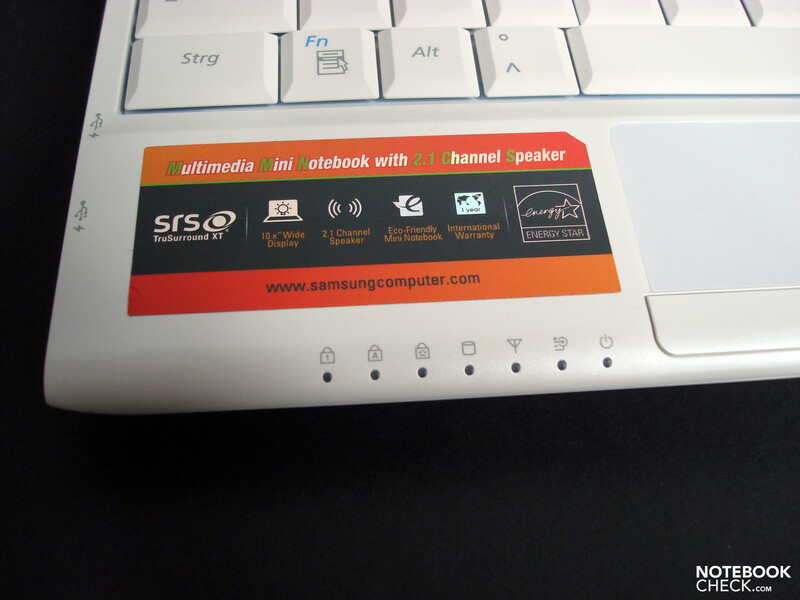 The Samsung is befitted accordingly with Bluetooth 2.0 and WLAN b/g for wireless communications. So there's nothing standing in the way of using external periphery, as for instance USB hard disks, Bluetooth mice and external monitors. 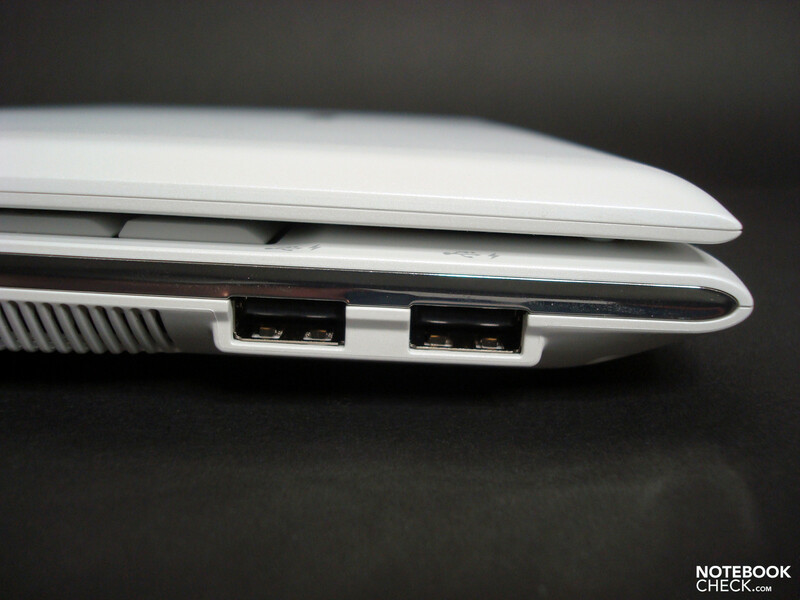 Not everyone will take a fancy to the port distribution though, which doesn't always seem practicable as the left-sided USB ports are far front and the audio sockets are on the right. 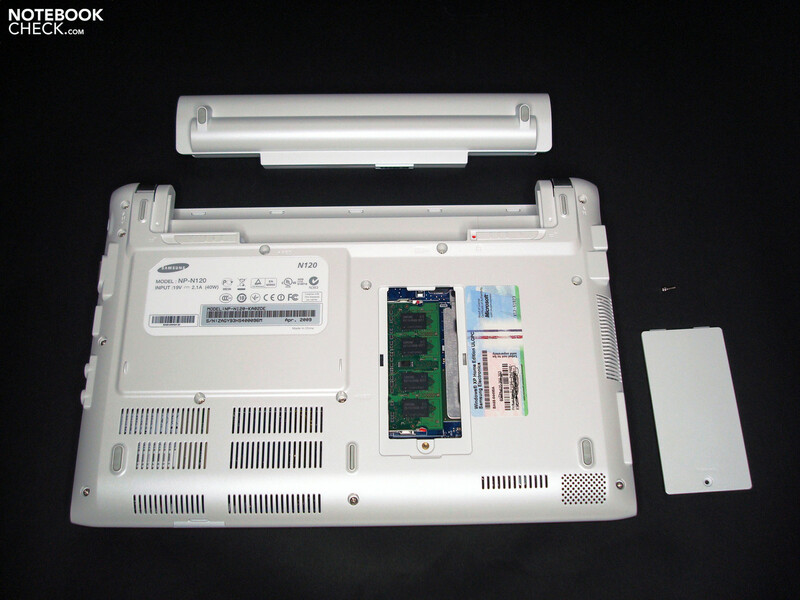 Netbooks are faced with very tight limits as to possible upgrades and are restricted internally to a larger RAM bar (requires the removal of the prevailing 1 GB bar) and bigger hard disks. Our test model has a 66 Wh 6 cell battery. On Samsungs homepage you can also find information about an optional 24.4 Wh 3 cell battery (up to 3 hours runtime) and a 57.2 Wh 6 cell battery (up to 8 hours runtime). The smaller one will probably lead to a lower total weight and a plane stance. 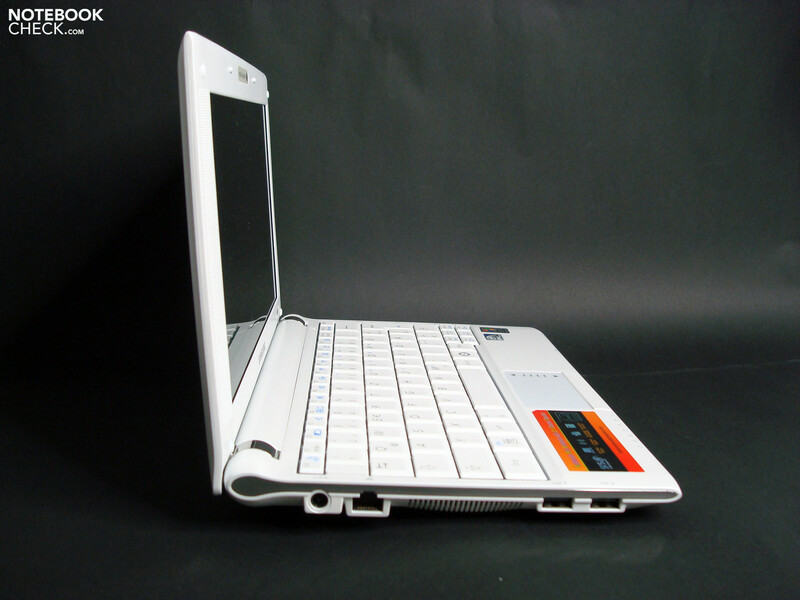 The already good characteristics of the NC10 keyboard have been commendably maintained, but additionally the extended case breadth has also been used to treat return with a larger key. This leads to a significantly more pleasant sense of space, as the key size now reaches about the 12" standard, according to Samsung. This practically results in a considerably lower typo rate and will satisfy frequent writers even faster. 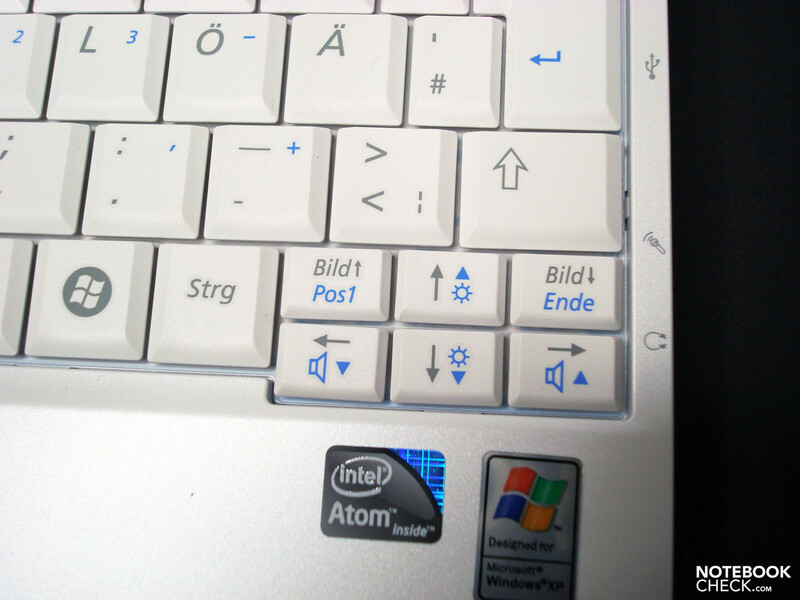 As usual there are several special functions found among the FN combination possibilities, which is extended to the sufficiently sized arrow keys. These could be dimensioned a bit more opulent than usual, as they have been moved slightly into the wrist rests. The sufficiently large touchpad spoils with good gliding traits, a pleasant surface and an exemplary response. 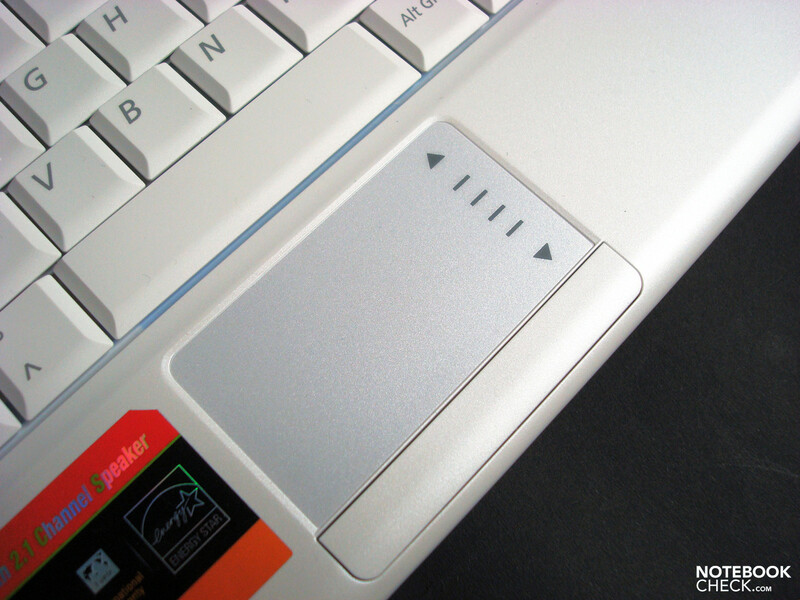 The quiet touchpad key, which merely reacts a tad indifferent in the center due to the one-key construction, appears to be of equally high-quality. It's an ease to use the right, optically highlighted, scrolling area right away, without an accommodation period. 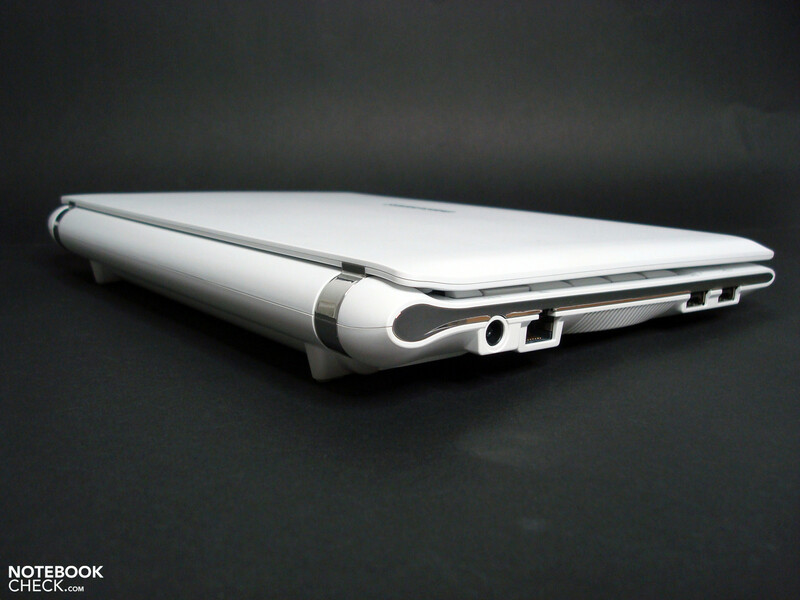 Although the case would allow a 12", there is merely a 10" derivate found in the N120. 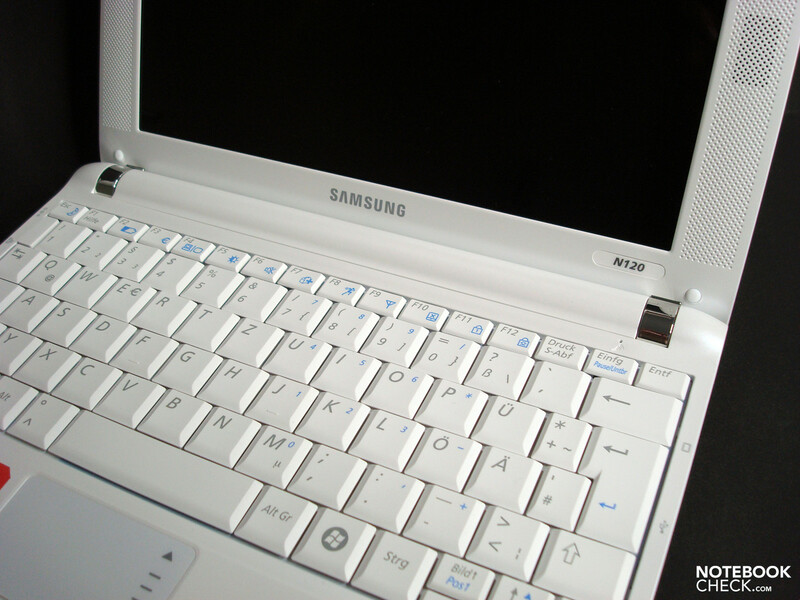 The Samsung made screen rather belongs to the conservative netbook division with a WSVGA resolution (1024x600 pixels) in a 16:10 aspect ratio. 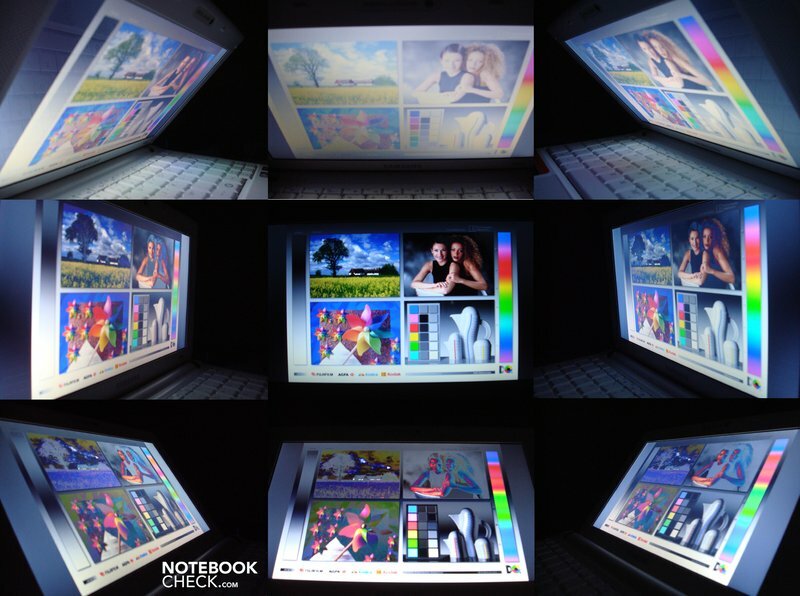 The most obvious innovation, without having to turn on the notebook, is the smooth, glossy display surface, which could already work as a mirror in this condition. This impression is reduced when it's activated, but calls for a very well-considered choice of location, even indoors. Bright clothes, adversely positioned light sources or dark image contents over layer the intrinsic program window and make it necessary to strenuously separate image and surrounding contents visually. Samsungs own "SuperBright High-Gloss LED Backlight Display" will also not win a page in glory in this sub-discipline. Samsung commendably belongs to the few manufacturers, which can even make statements to this characteristic but, regrettably, it doesn't permit conclusions about the quality in our test case. The maximum brightness specification of 200 cd/m2 is, unfortunately, so strictly followed that you would apparently like a bit more buffer in order to not exceed the stated peak value. The brightest point at nine measuring points is found in the central nominal range and reaches 196 cd/m2. The values decrease notably towards the edges, which decline down to 141 cd/m2. The promise is therefore not kept and is additionally downgraded by a low contrast value of 187:1 and an illumination of merely 72%. 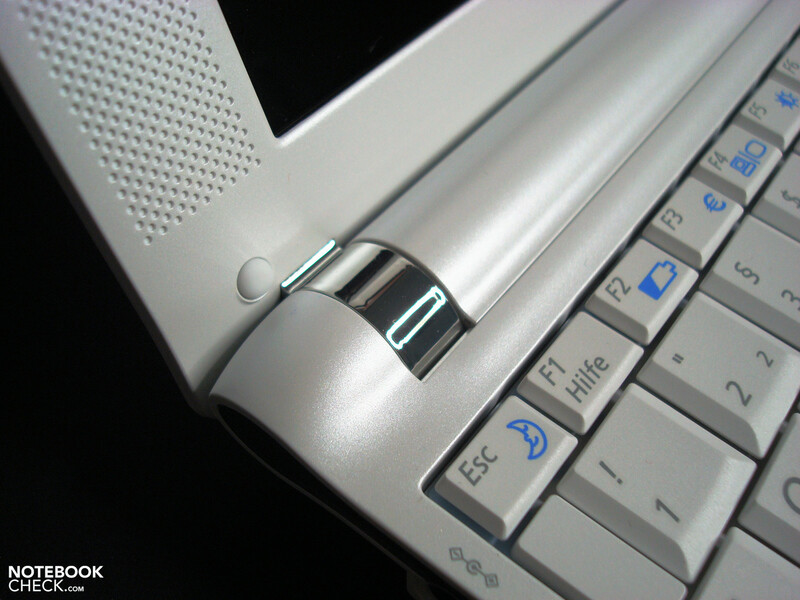 The display's vertical viewing angles are subject to changes sooner and much stronger than horizontally, as for netbooks typical. Colors bleach out from a downward view and invert at viewing angles from the lower area. 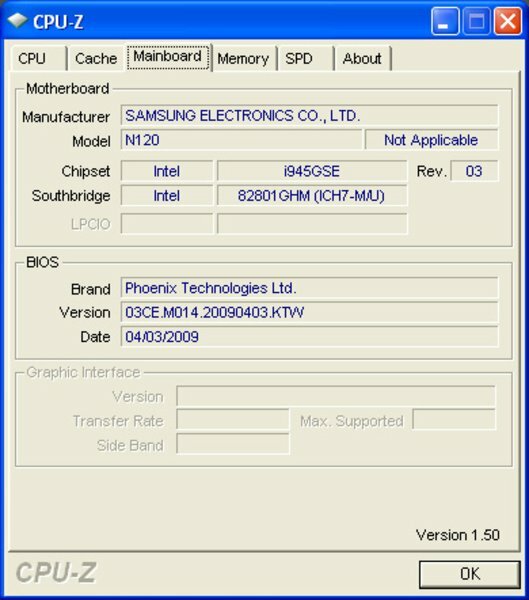 Old acquainted components are found in Samsung's N120 performance department. 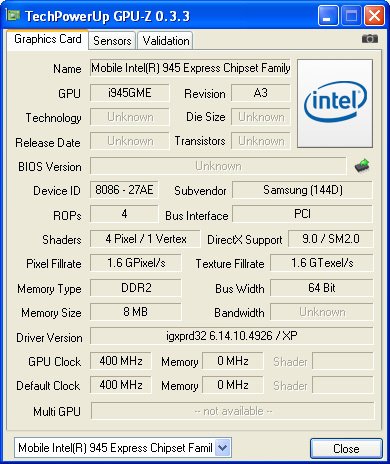 Aside from the Intel N270 CPU, based on the Intel Atom range, the usual GMA950 graphic chip set is built-in. 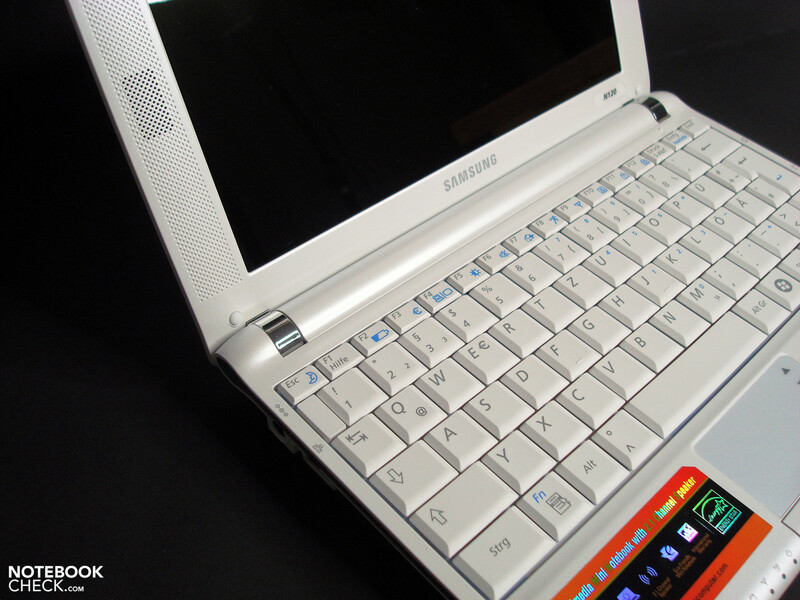 These main components are supported by a 1GB DDR2 RAM and a 160GB hard disk from Samsung. The latter delivers good values with an average transfer rate of 52.1 MB/s and has, with the in the meantime standard capacity, sufficient space for documents, pictures and music. 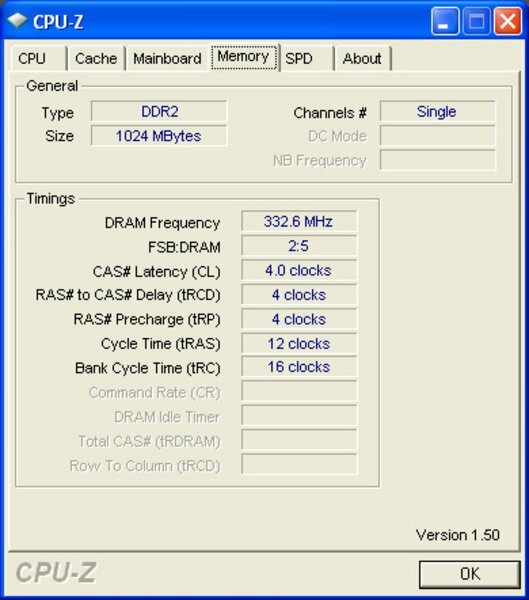 The benchmark results present themselves fitting to the unspectacular configuration with 241 points in the 3DMark '05, 274 points in the Cinebench R10 OpenGL Shading and 541 respectively 828 points in the Cinebench R10 single and multi CPU rendering. This results in a 4.8-fold iTune conversion of our 5 test songs and to a studder-free rendering of our iTune H.264 test film "Shooter" in the praxis. The system gets rather inert at simultaneous use of several programs or more demanding tasks such as image editing with filtering and/or larger files at the latest. 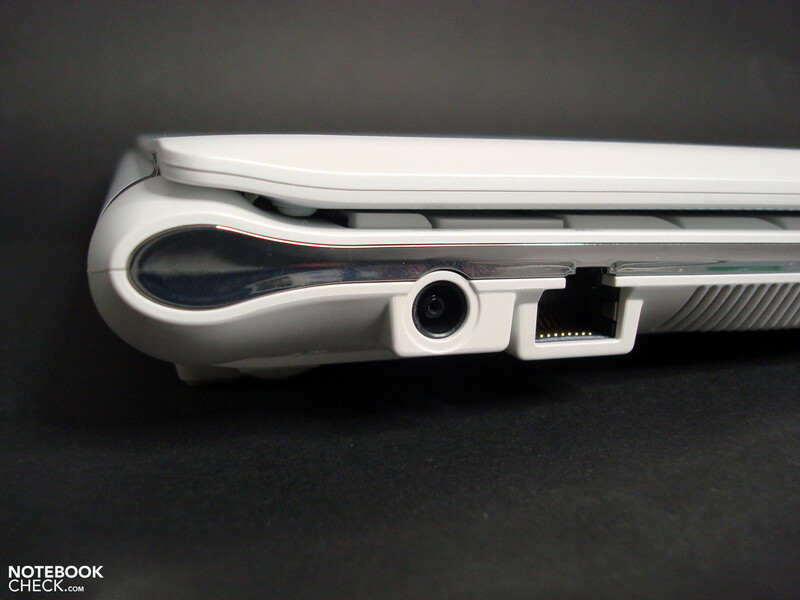 The Samsung N120 wasn't able to play Full-HD videos, just as much as it wouldn't be suitable for contemporary games. The usual suspects, such as browser, office and Skype could be operated adequately fast and confirm the objectives of this device category. The Samsung N120 moves in a very narrow and also very quiet noise corridor with a noise behavior of 30.7 dB(A) to 32.6 dB(A). 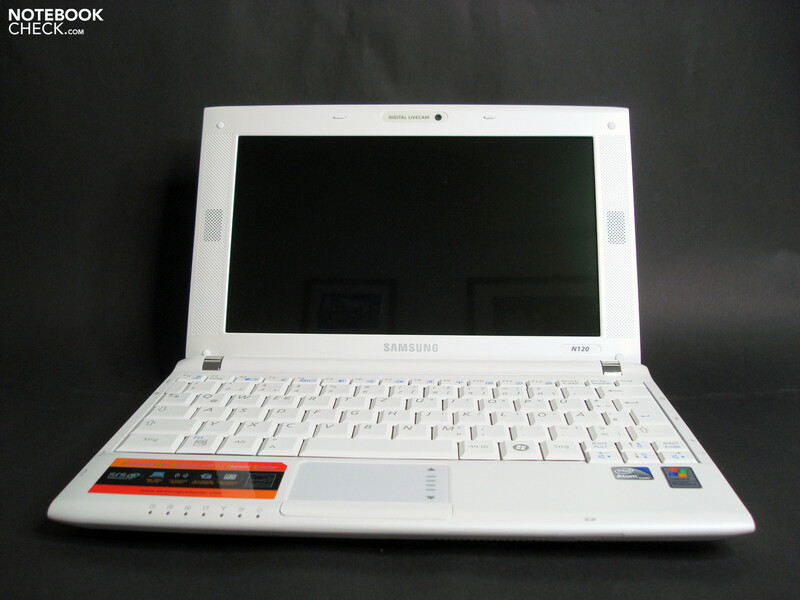 Barely audible and even under full load just noticeable, but never disturbing, the Samsung can be described as a very quiet netbook. The noise character, which belongs to the soothing natures, is perceived as especially pleasant. 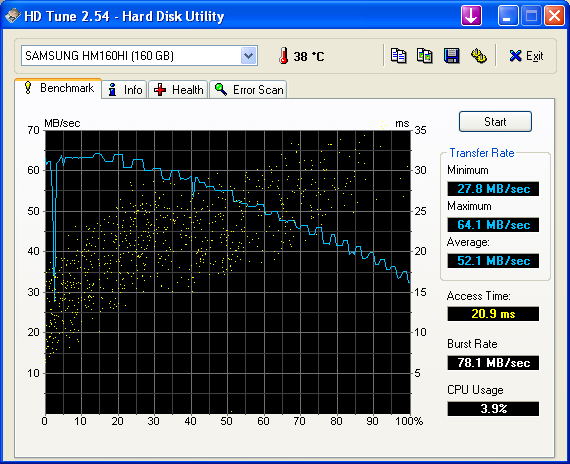 It seems that the Samsung technicians have taken a higher case temperature into account for the low noise behavior. While an unpleasant feeling doesn't yet turn up at a maximum of 39.1°C in the keyboard area, it can get rather warm at the base's right front corner with 46.2°C. A comfortable working on the couch with the thighs as a desktop can therefore quickly lead to a premature end, depending on the load. 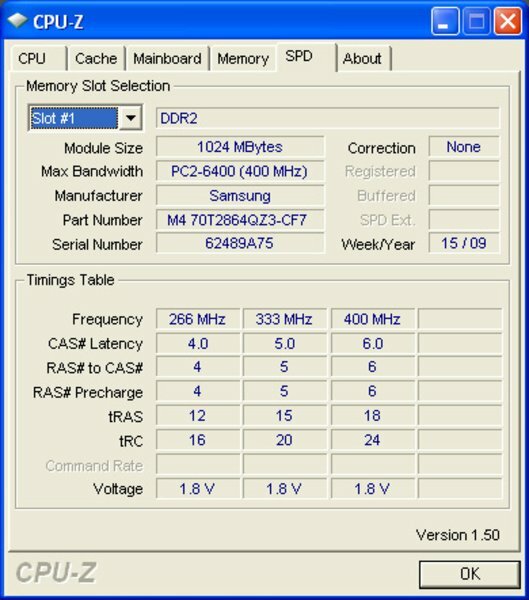 (±) The average temperature for the upper side under maximal load is 37 °C / 99 F, compared to the average of 29.8 °C / 86 F for the devices in the class Netbook. (+) The maximum temperature on the upper side is 39.1 °C / 102 F, compared to the average of 33 °C / 91 F, ranging from 21.6 to 53.2 °C for the class Netbook. (-) The average temperature of the palmrest area of similar devices was 29.3 °C / 84.7 F (-9 °C / -16.2 F). 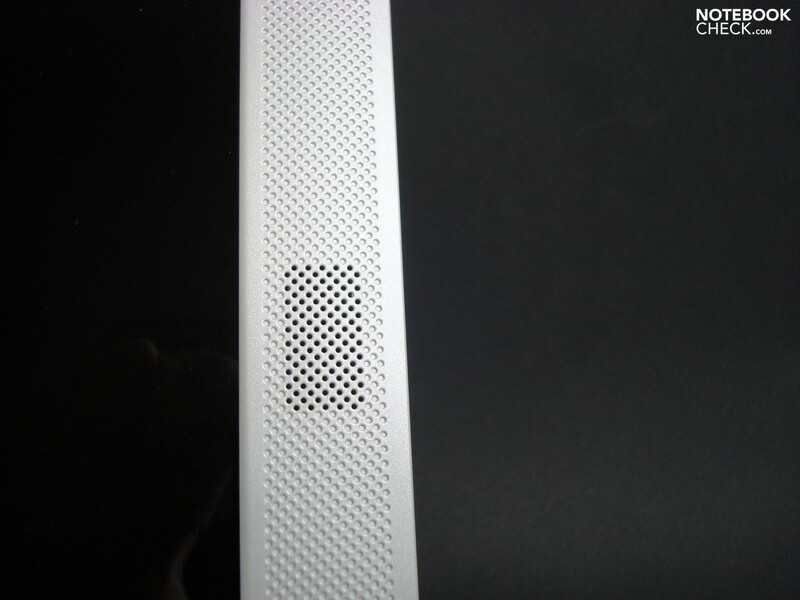 The loudspeaker accommodated on the left and right of the display bezel are supported by a subwoofer in the base. This leads to considerably more midranges and basses at sound emission, which turn out to be quite adequate and balanced for notebook conditions. The use of an additional USB loudspeaker or earphones can be waivered on for a considerably long time and more often. Audiophilic bon vivants will, however, barely be satisfied and will have to, as usual, set on external solutions in order to exhaust the HD sound chip. 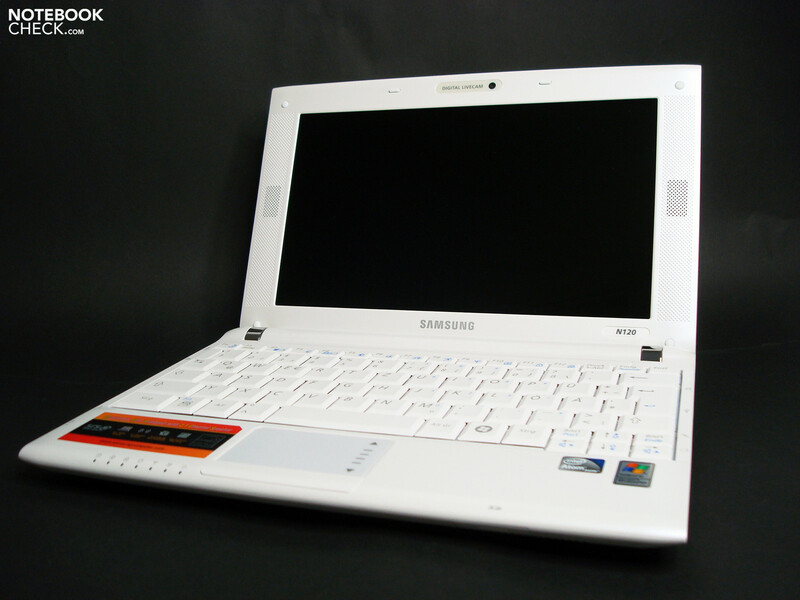 Samsung has provided the N120 with optimal potentials and delivered our test model with a 66Wh 6 cell battery. 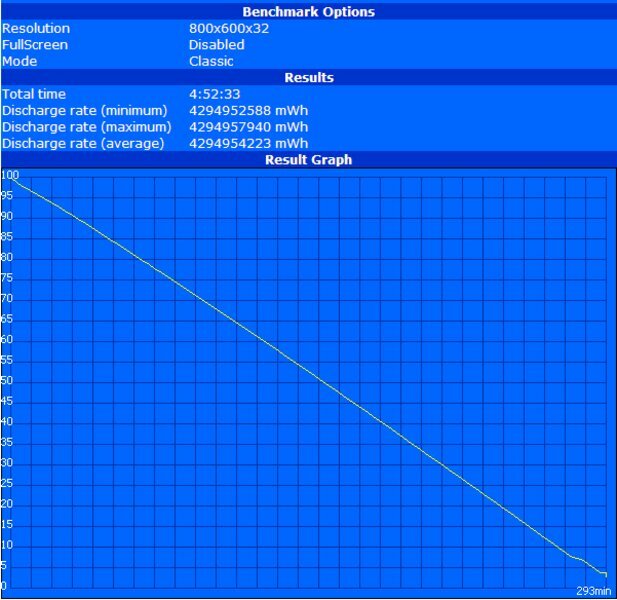 Both alternatively available batteries with a lower capacity (24Wh/57Wh) give accordingly lower runtimes. Aside from the energy reserve, Samsung has also filed on the energy management and achieves a reduction of the minimum power consumption with an own Battery Manager to 7.8 Watt. 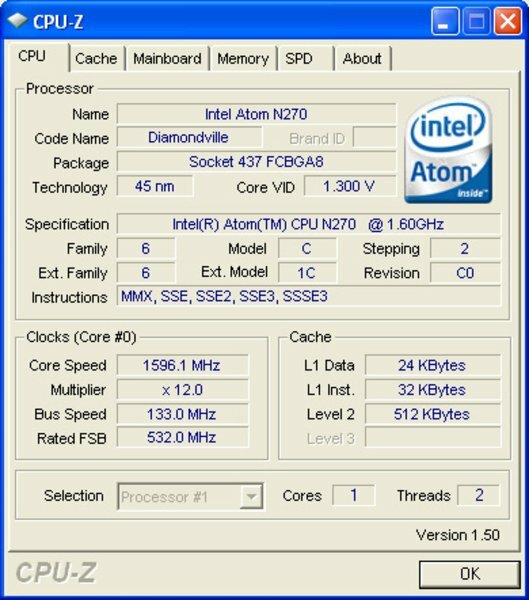 It even stays rather humble at full load with 18.6 Watt at the peak, but can't keep up with the even more economical components of the Intel Atom Z530/GMA500 combination, which comes clear with a maximum of 14 Watt in the MSI U115. 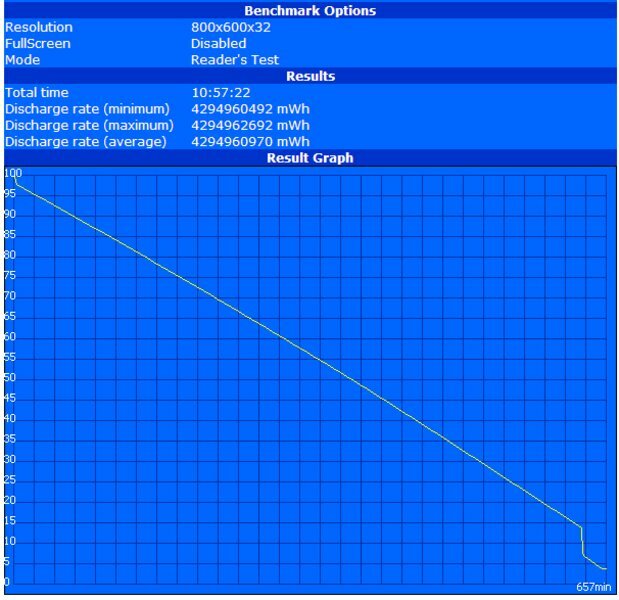 Expressed in runtimes, this concretely means a maximum of 657 minutes of mains independence in the BatteryEater Reader's test (maximum runtime, WLAN/BT etc. 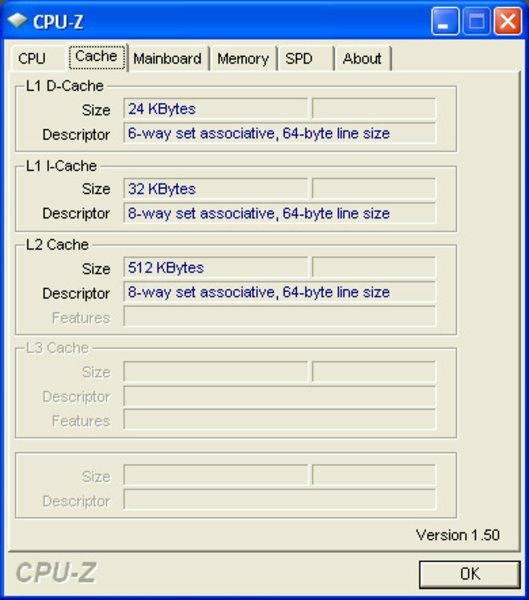 off, lowest display brightness), 293 minutes of minimum runtime in the demanding BatteryEater Classic test (minimum achievable runtime, all components on, display with full brightness, full load) and 428 minutes runtime in the practical WLAN test with browser execution (smooth working at a pleasant display brightness, WLAN on). Therefore, practical runtimes of around 7 hours shouldn't be uncommon and could very well bridge some work day. The Samsung N120 could boast with welcome detail innovations in a few areas, but allows itself to take a grave step backwards just exactly at the most important interface to the user - the display. Especially pleasing are the good sound emissions, the higher battery life with, at the same time, a lower weight, the improved (because bigger) keyboard and the pleasant low noise level. In return, Samsung's renunciation from the NC10's good display to an obviously poorer product is inconceivable. Aside from the now glossy display surface, which conjures up very restricting reflections, you also have to live with visibly lower brightness and contrast values. Depending on the scenario, the relatively high temperature development on the base - the downside of the low noise level - is also detrimental. The port arrangement, which could lead to obstructions with connected periphery, shows itself as less restrictive, but worthy of improvement for some. Basically, the Samsung N120 has lost some appeal in comparison to the NC10 and sees itself exposed to a very strong competitive pressure. 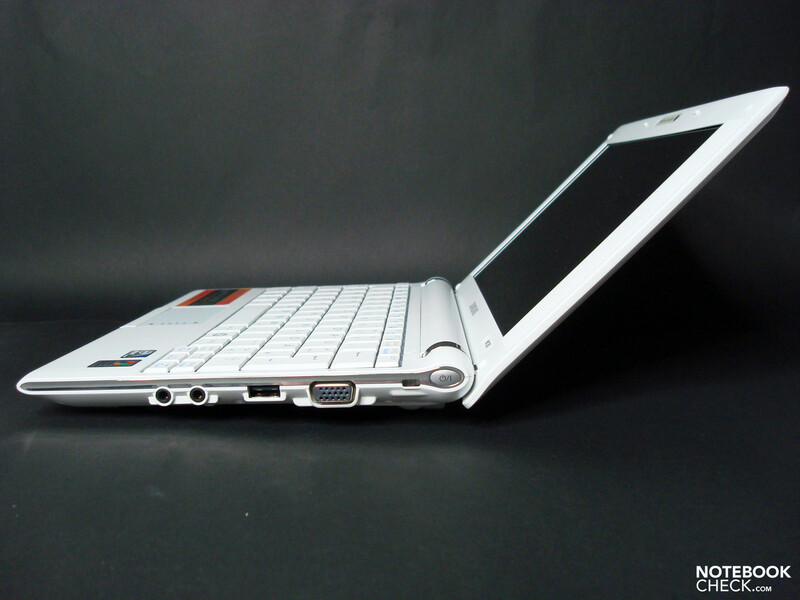 Many thanks to Notebook.de, who kindly provided us with the test device. You can configure and purchase it here, as well. The chic design, the long runtime and the good workmanship. A good display with a matt surface and better contrasts. 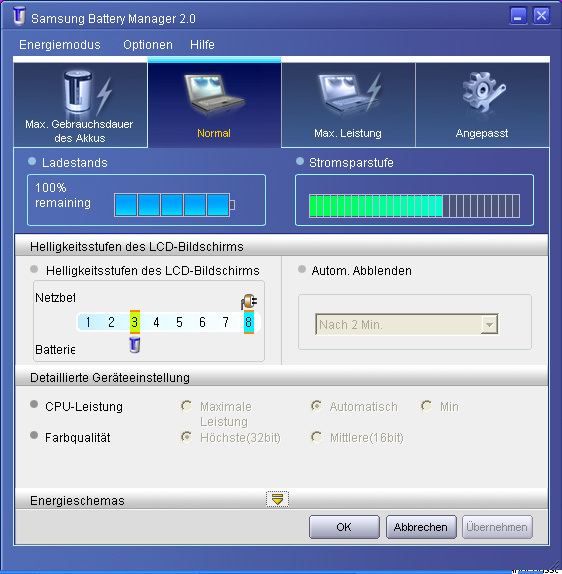 ...that Samsung has achieved to reduce the power consumption to such a low level, despite conventional components. ...is strong and is found in-house with the NC10, among others. 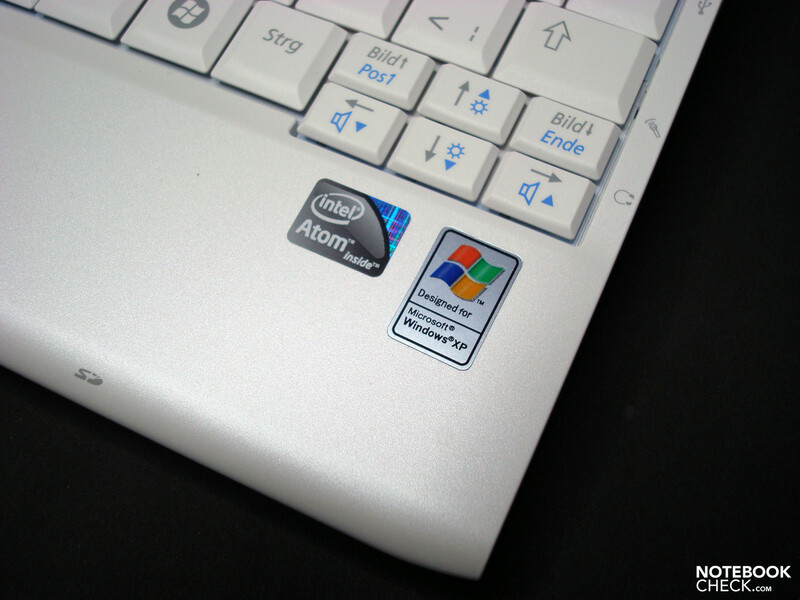 But also the Asus Eee PC 1000 HE , Dell Inspiron Mini 10 or MSI Wind U115 are tough rivals.